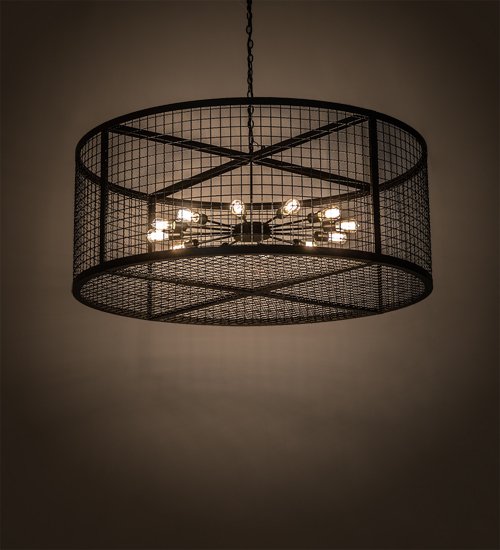 Description: Discover a unique decorative look and industrial lighting design featuring a dramatic caged frame. The pendant features 12 customer-supplied, Edison styled lamps displayed from within. Paloma Golpe offers solid hardware, frame and grill in a Textured Black finish. The overall height ranges from 31 to 91 inches as the chain length can be easily adjusted in the field to accommodate your specific lighting application needs. Illuminating dining tables, conference tables and other residential and commercial spaces. Handcrafted in our 180,000 square foot manufacturing facility in Yorkville, NY. Dimmable energy efficient lamping options offered. Special sizes, designs and finishes available. UL and cUL listed for damp and dry locations.